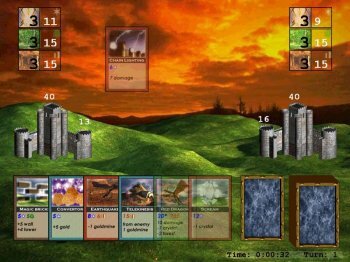 OverTower is a fantasy based card game with a strategic gameplay. To win a game You are to destroy a tower of the opponent. Any game action (damage dealing, castle repairing, resources increasing) is realized by the many types of cards (45 unique cards with artworks performed in a fantasy style). The card represents a spell or creature. It has got a cost and action. Resources are represented by Crystals (produce Mana), Forests (produce Wood) and Gold Mines (produce Gold). There are many ways to win this game. Choose your own strategy to beat down the enemy. The game has a handy click-to-play interface with a sounds, music and animations.